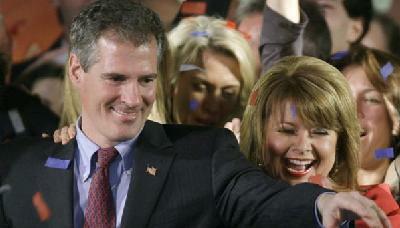 *In a stunning blow to President Barack Obama, Republican Scott Brown won a bitter Senate race in Massachusetts on Tuesday and promised to be the deciding vote against his sweeping healthcare overhaul. Brown’s win robbed Democrats of the crucial 60th Senate vote they need to pass the healthcare bill and sent shudders of fear through Democrats facing tough races in November’s congressional elections. What once seemed an easy Democratic victory turned into a desperate scramble in the last few weeks as Brown surged ahead of Democratic state Attorney General Martha Coakley on voter fears over the economy, the healthcare bill and Obama’s agenda. Brown, a Massachusetts state senator, said he would be the pivotal 41st Republican vote against the healthcare overhaul in the 100-member Senate. He said voters rejected the closed-door deals that were driving the healthcare debate, and he took satisfaction in proving the experts — and Democrats — wrong. Brown’s upset with 52 percent of the vote in heavily Democratic Massachusetts raised the specter of large losses for Democrats across the country in November and left the party scrambling to find answers. Get MORE of this Reuters article HERE. To find our MORE about Scott Brown, visit his Wikipedia profile HERE.